I’m extremely excited to announce the birth of my third baby, Bailey!! Days before her birth I made this easy little sweater for her. 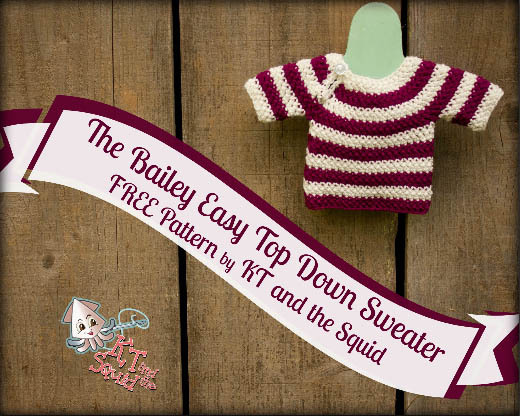 To celebrate her birth I’m offering this pattern for FREE! I love this little sweater because it works up so quickly. Perfect for a last minute baby shower gift or to make when your bored waiting for baby like I was. Edit: This pattern is now available in larger sizes for purchase. For more info click HERE. This pattern is copyrighted by KT and the Squid. You may NOT copy, share, change or sell the pattern itself. If you’d like to sell finished items from this pattern please do! Finished items belong to you and you may do what you wish with them. If you choose to sell them online I’d love credit for the design! All KT and the Squid patterns are tested by wonderful volunteers. If you have any questions feel free to ask and I’ll try to help! Final measurements: 14” chest by 7.5” long. Sweater should stretch to fit up to about a 16” chest. Gauge is worked in alternating rows of sc and Herr dc. Save time and check your gauge! If you’re unsure how to do this please read this blog post. Sweater is worked from the top down in one piece. The first 6 rows are worked flat for the button opening. The rest of the sweater is worked in joined rounds. At the end of every round join with a ss to the first st of the round. You will turn every round. Be careful not to work into the ss join unless instructed to do so. Herringbone double crochet (Herr dc): Yo, insert hook into st indicated, yo, pull through st AND 1st loop on hook, yo, pull through 1 loop, yo pull through last 2 loops. Work 2 rows/rounds in the MC, then 2 rows/rounds in the CC throughout the sweater. To change color, work to the last step of the last st before the color change. Draw up a loop of the new color to complete the st and continue with pattern. Drop the unused color at the end of each stripe and carry it up through the inside of the sweater. Do not fasten off unless instructed. Repeat rounds 3-6 one more time. Repeat rounds 3-4 one more time. With WS facing join MC to any st of the arm opening. Fasten off, repeat on other arm. *For full length sleeves complete repeat rounds 1-6 one more time for 6 total stripes. With RS facing join MC to the first ch of the foundation ch. Row 1 – Ch 4, ss in the same st, sc evenly (about 2 sc per stripe) around the opening, fasten off. Weave in all ends, block if necessary, sew on button.